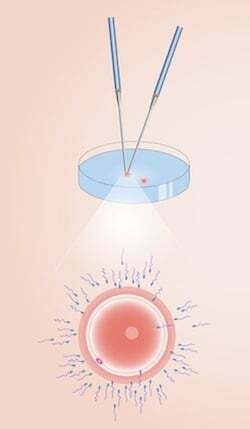 Studies on the impact of in-vitro fertilization (IVF) on cancer risk have reported and denied a connection. A recent study published in the journal Fertility and Sterility from researchers in Israel, confirms no connection between cancer risk and IVF treatment. When the number of cancer cases in the IVF group was compared to the control group, researchers found a slight elevation in ovarian cancer cases, but with a total number of cases at only 45 there could be no definitive link between IVF and ovarian cancer. Higher risk ratios were noted in patients receiving four or more IVF cycles. There was also a small increase in the number of endometrial cancer in women who received one to three cycles, but the risk lowered again with subsequent IVF cycles. While no increased risk of cancer was found in the IVF group, researchers note that women receiving IVF treatments need to be regularly monitored for cancer. Repeated exposure to ovarian stimulation and ovarian puncture is reason enough for increased monitoring. Source: Louise A. Brinton, Ph.D. et al. In vitro fertilization and risk of breast and gynecologic cancers: a retrospective cohort study within the Israeli Maccabi Healthcare Services. Fertility and Sterility - 30 January 2013 (10.1016/j.fertnstert.2012.12.029).